The ‘Living Tree’ Healing Centre – www.livingtreehealing.com – was named enthusiastically and unanimously by our founding five women – Adria, Jaya, Jessica, Laila & Reta. 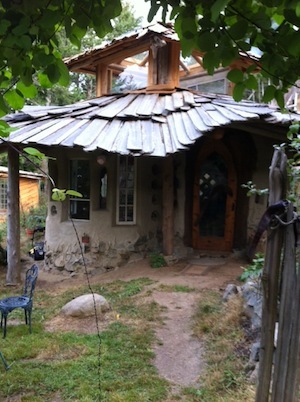 The synchronicity of our name not only comes from the environment surrounding this beautiful cob cabin, but a parallel story from history on the conception of the Living Tree doctrine. The [her]story of 5 Canadian women who challenged the reading of the constitution to be “of an organic process”, 83 years earlier. As a result, women were formally recognized as persons under the law and a doctrine was established to ensure that society’s principles would be interpreted and adapted to changing times; “like a living tree capable of growth and expansion within its natural limits”. Thus our name was adopted with the same spirit ... to create a healing space for the whole community 'capable of growth and expansion within its natural limits'. We are in our community, for our community, of our community. Jessica Hepper has been studying and practicing the Healing Arts since she came to Lasqueti 16 yrs ago. Her background includes Jin Shin Do, Reiki, Harp & Healing Touch Therapy, Chair Massage and most recently her Collaborative/Intuitive Massage with Jaya. CHAIR MASSAGE, HARP & HEALING TOUCH (with Vaughan) & TRINITY MASSAGE (with Jaya). Reta is a Registered Clinical Counsellor (RCC) and experienced Mental Health Counselor with a specialization in sleep medicine (RPSGT, RST), sleep disorders therapy, testing and treatment which spans 19+ years experience. Now available direct to you through Skype, phone and/or email connections, Reta provides therapeutic coaching, guidance and support for a wide range of sleep difficulties including insomnia, non-restorative sleep, nightmares, recurring dreams, circadian rhythm disorders, and more. Sleep well = Live well! Supportive, confidential, interpersonal counselling also available. My therapeutic style aims to partner with you, listening carefully & using an integration of approaches and assessment tailored to your personality, presenting challenges and goals for change. I have additional training in Attachment-based theory and therapy, Jungian psychology, MARI ® art therapy assessment, Lifespan Integration therapy, and Dialectical Behaviour Therapy (DBT). Please see www.40morewinks.com or email info [at] 40morewinks [dot] com for additional information and scheduling availability. Laila Duggan is a certified rebalancing bodyworker. Rebalancing is a holistic body work used to release muscular and psychological holding patterns in the body caused by physical and emotional traumas. With a strong focus on joint release and deep tissue massage this technique aims to restore harmony between body mind and heart. Adria will be offering Jin Shin Do® Acupressure & Qi Gong sessions every Friday starting November 2nd. She is a registered Jin Shin Do practitioner and teacher and has been practicing full time since 2004. Jin Shin Do® is a healing art that combines Eastern and Western technique to balance the body and mind, restore a sense of peace and clarity and ease physical tension. A session uses the deliberate and yet gentle finger pressure along acu-points to release pain, improves a feeling of wellbeing and offers an opportunity to clear stress and dis-ease both physically and emotionally.